With summer comes friendly barbecues and cookouts with friends. The long 4th of July weekend gave us the chance to spend time with some out of town friends and family at a barbecue. Now we live in a fairly rural area where it’s not unusual to pass farm equipment on the road to work, but these friends live waaaay out in the country. Our barbecue gathering ended up taking place in the middle of a field, about half a mile from the nearest house, refrigerator and indoor plumbing. And I was asked to bring a dessert. So what tastes good warm and melty, doesn’t spoil in the heat, and delights people of all ages at barbecues? S’mores, of course. 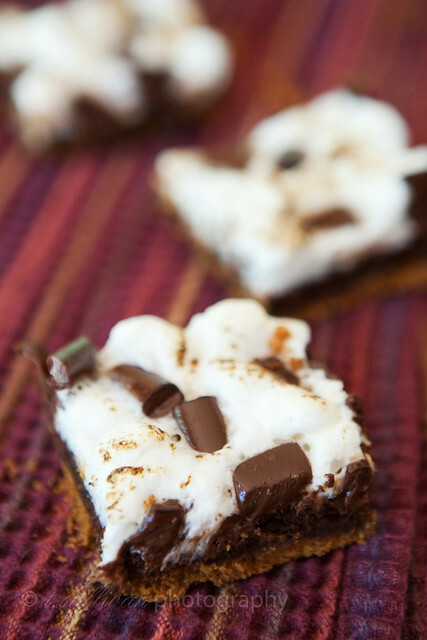 But pre-assembling s’mores and driving them out to the country without making a mess would be impossible, so I turned them into the next best thing: s’mores brownies. These brownies have a crunchy graham cracker crust on the bottom and a layer of rich chocolate brownies in the middle, all topped with toasted marshmallows and semi-sweet chocolate chunks. They’re a chocolatey crunchy ooey gooey mess just like real s’mores. You’re going to love them! PS. You can use a blowtorch on them if you want! These brownies are a sticky mess to cut while they’re still warm. After they cooled I popped them in the freezer for a few minutes, then spritzed a pizza slicer with baking spray to cut mine – it worked perfectly. Preheat oven to 350°F. Line 9×13 inch pan with aluminum foil, leaving about 2 inches of overhang on each end. Grease generously with baking spray, especially the sides. Break graham crackers into large chunks and arrange in food processor bowl. Pulse until crackers are fine crumbs. While pulsing, drizzle in melted butter and continue pulsing until crumbs resemble wet sand. Press crumb mixture firmly into bottom of prepared pan. Bake at 350&degF; for 5 minutes. Remove from oven and cool 10 minutes. Meanwhile, whisk cocoa powder and flour together in a small bowl. Combine melted butter, sugar and salt in a medium bowl. Whisk eggs into butter mixture until completely combined, then whisk in flour mixture. Batter will be thick. GENTLY spread brownie batter evenly over graham cracker crust. Bake 20 minutes at 350°F. While brownies layer is still warm, top with marshmallows and sprinkle with chocolate chunks. Bake 5 more minutes, or until marshmallows start to melt. Cool completely before cutting. Lift brownies out by foil overhang to cut. To get the authentic s’mores toasted marshmallow look, use a kitchen / creme brulee blowtorch to scorch the top marshmallow layer. These are totally the perfect solution to the heat problem! So delicious. this would be a constant hit at any event! they look so delicious, so scrumptious! These look great. All my favorite things in one bar! I’ll definitely be trying these soon. I’ve always wanted to use a blowtorch. I may just have to make these. S’mores are kinda my favorite food. OMG I’m making those this weekend! I had to fight the urge to use the caps-lock yet, that’s how freaking excited I am about S’MORES BROWNIES! 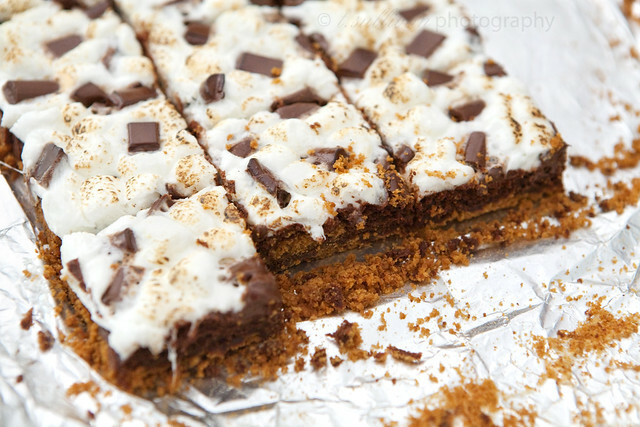 I scoured the internet for a smores brownie and none fit the bill… until I found your site! OH MY! Thank you so much for posting these! We ate them still warm and they are ooey gooey good! GOING IN THE FAVORITES!